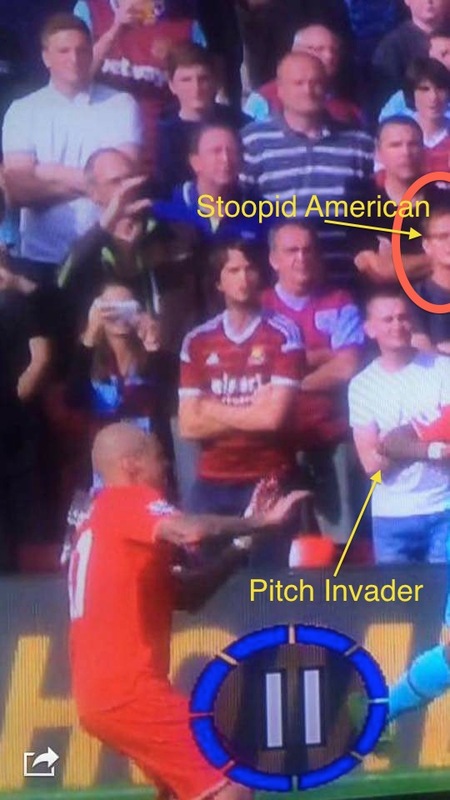 Most people who read this blog are probably aware that the Stoopid American is temporarily in London. That means that I have been able to attend West Ham United’s 3-4 home loss to Bournemouth and their historic 3-0 away victory over Liverpool last weekend. I’ll write more about those experiences at some point, but for now I want to think about what the games suggest about the three coaches involved. Howe, Bilić, and Rodgers have all played against one another in the past two games, each with a 1-1 record (Bournemouth lost to Liverpool before facing West Ham). But there’s no doubt that Howe currently looks the best of the bunch. His newly promoted side played Liverpool hard before conceding a late goal to Christian Benteke, and they deserved much more than a one-goal lead against West Ham. Despite limited resources, Howe has managed to integrate new players (Max Gradel, Artur Boruc) into his Championship-winning side while maintaining their successful attitude and attacking style. Howe has also demonstrated that his style allows for tactical variation. As Mihail Vladimirov noted, Howe’s team employed a mixed approach against Liverpool, combining deep-lying defending with intermittent high pressing by all four attacking players further supported by the midfield and fullbacks. While the former predominated against Liverpool, it was a consistent use of the latter that undid West Ham. While most critics focused on the width of Howe’s attacking 4-4-2, it was really the organized pressing of his team that upset West Ham’s ability to build an attack and led to repeated turnovers, especially by fullbacks Aaron Cresswell and Carl Jenkinson. Bilić tried to respond early on by replacing Angelo Ogbonna, who defended solidly but was hopeless in terms of distribution. Consistently, Ogbonna waited too long to play the ball out, and would then often play a short pass to Cresswell, right beside him and already under pressure. In truth, substitute James Tomkins didn’t help much, but at least he didn’t put teammates under pressure in dangerous situations. With the passing lanes covered, too much was asked of Jenkinson in terms of bringing the ball out. He constantly attempted to beat Gradel and was embarrassed by the Ivorian all afternoon, culminating in a red card (though Gradel had moved inside by that point, Jenkinson was still clearly rattled by him). Both Cresswell and Jenkinson had very poor performances, but Bournemouth’s high press was the context which laid the groundwork for those “individual” errors. Given the road map Howe’s team provided, it’s not clear why Brendan Rodgers didn’t set his team out to press West Ham. It’s possible Rodgers didn’t feel he had the personnel for a consistent high press, especially with the energetic Jordan Henderson injured. But James Milner was available, and could have been played higher up the pitch in a wide role. Whether Benteke or Philippe Coutinho could have been asked to consistently close down center backs is less clear, but it’s also likely that Rodgers didn’t think he needed to alter his game plan at home against a smaller side. Whatever the reason, West Ham was under offensive pressure, but free to play out of the back and counterattack when they got possession. Like Bilić against Howe, Rodgers made changes to try and change the dynamic of the game, but to little effect. He shifted from his original 4-3-3 to a wider 3-4-2-1 at halftime, and made additional attacking substitutions to chase the game after Coutinho’s dismissal. But none of these formations pressed West Ham. In fairness, it’s not clear that Liverpool could do so once they were a man down. 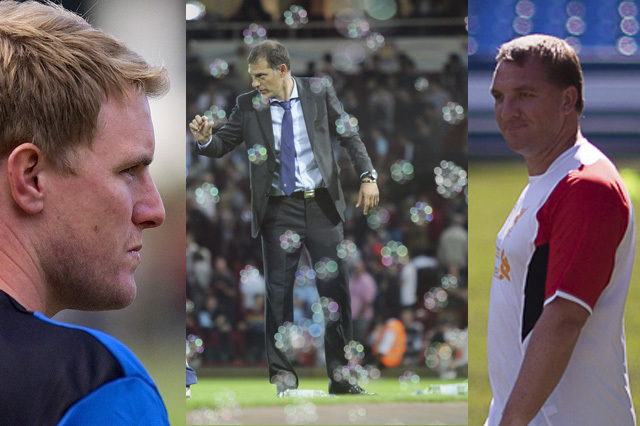 While Eddie Howe clearly has the most difficult long-term job of these three managers in trying to keep his small club up, both Rodgers and Bilić are under much more immediate pressure. Some claim Liverpool’s Saturday game against Manchester United is critical for Rodgers’s future at the club, while the KUMB podcast suggests that Monday’s home game against Newcastle United may prove defining for West Ham’s season. Neither Bilić nor Rodgers have as much room for error as they would like, and neither look fully convincing at the start of this season. Header image combines photos from Stuart Bramley, joshjdss, and Bernard Chan, used under a Creative Commons license.